The global dental chair market is competitive in nature with several players operating in it across the globe, states a new market research study by Transparency Market Research. The key players operating in the market are expected to emphasize on research and development activities, which is estimated to generate potential growth opportunities in the next few years. In addition to this, development of new product and innovations are further predicted to encourage the growth of the overall market in the next few years. Some of the leading players operating in the dental chair market across the globe are Danaher, A dec Inc., Dexta Corp., Dome Inc., and DentalEZ Inc. The rising number of strategic collaborations and mergers and acquisitions are anticipated to enhance the competitive scenario of the overall market in the next few years. According to the market research study by Transparency Market Research (TMR), in 2017, the global market for dental chair was worth US$455.5 mn and is projected to reach a value of US$551.8 mn by the end of 2022. The market is projected to register a healthy 3.90% CAGR between 2017 and 2022. The global dental chair market has been classified on the basis of geography into North America, Latin America, the Middle East and Africa, Europe, and Asia Pacific. Among these mentioned segments, Europe is anticipated to witness high growth and lead the global market throughout the forecast period. The high growth of this region can be attributed to the rising pool of patients who are suffering from teeth related disorders, thus encouraging the growth of the overall market in the next few years. As per the study, North America is likely to be on the second position in the global dental chair market in the next few years, owing to the presence of an advanced healthcare and medical infrastructure. Furthermore, Asia Pacific is estimated to witness a healthy growth in the next few years. The global market for dental chair has been classified on the basis of product type into oral surgery chairs, examination chairs, portable chairs, and orthodontic chairs. Among these, the oral surgery dental chairs is estimated to witness high growth throughout the forecast period. The high growth of this segment can be attributed to the growing demand for these chairs across the globe. Furthermore, technological advancements and innovations in the field are anticipated to accelerate the growth of the overall market in the next few years. A significant rise in geriatric population and the growing number of dental disorders are some of the key factors that are anticipated to encourage the growth of the global dental chair market in the next few years. Development of new product and innovations are further predicted to encourage the growth of the overall market in the near future. In addition to this, the rising disposable income among people and the rising awareness regarding the benefits of maintaining good dental health are further estimated to enhance the growth of the market and generate promising opportunities for the market players in the next few years. 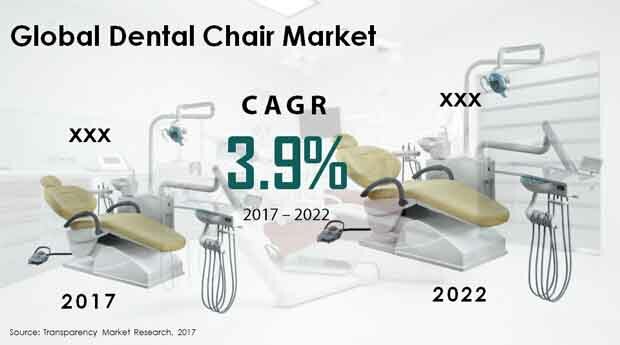 Growing geriatric population and rising dental disorders are estimated to encourage the growth of the global dental chair market in the near future. Developments and innovations in the global dental chair market to generate promising growth opportunities for market players.